Welcome to another Needle and Thread Thursday, y'all! I finished my scrappy string quilt, and oh man, what an undertaking! Scrap quilts are always my favorites. It is so much fun to revisit some of my favorite fabrics, and it feels like I've really accomplished something when I empty out my scrap jars in the process. I opted for a less traditional string layout on this one, and I'm really loving the single offset diamond. It really draws your eye in, so I thought Vortex was a fitting name for it. 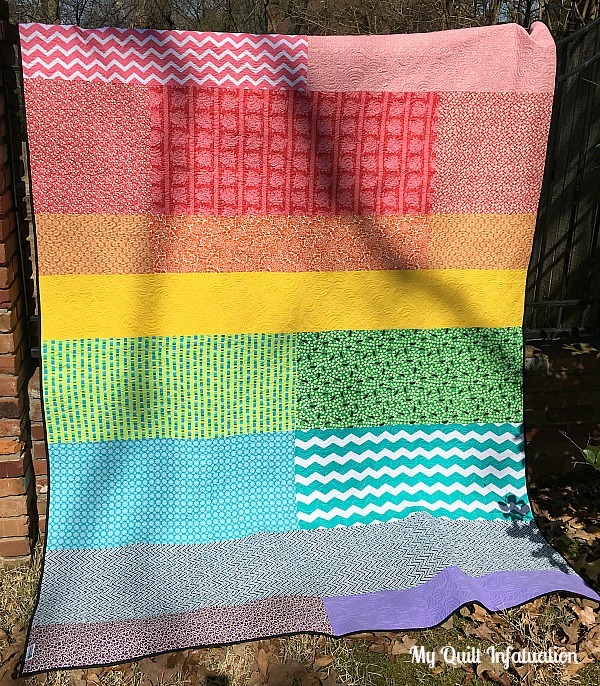 When I work with scraps that are bright and busy, I almost always choose either a black and white print for the back, or I make a rainbow stash backing. Rainbow backings are easy to put together, and a great place to use up some serious stash! 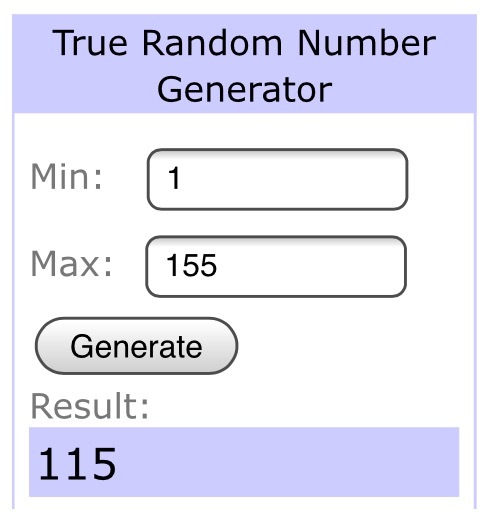 It feels like a win to make a quilt without purchasing a single shred of fabric. My spool ran out with only five blocks left to quilt. Since we don't have a local shop that sells Aurifil, that meant ordering and waiting for it to be shipped. grrrrr... I honestly don't know what possessed me to choose such a labor intensive motif for a quilt this big, but after almost 16 hours of quilting, I definitely appreciate the result! You can see it really clearly on the solid yellow. I framed out all of that crazy with a solid black binding, and the colors just pop against it. Someone once told me that adding just a little bit of black really makes a quilt sparkle, and I must agree! Since several of you asked after my last post, I figured I would quickly share my method for sewing string blocks without foundation piecing. I don't like sewing to paper if I can help it, and I don't want the extra weight from using a fabric foundation. I learned my lesson on that a few years ago, when I sewed this string quilt (a queen size!) to a Kona White foundation. I think that quilt weighs 20 pounds! Avoiding both of those is easy peasy if you use a square ruler. I used an 8.5 inch ruler, but you can use whatever you like. Just be aware of the length of your longest strings, and let that help you make your decision. To make a string block with this method, use your ruler as a guide to make sure your strings cover the ruler completely. Sew the strings offset, just as they are laid out, until you cover the whole area of the ruler. In my Vortex quilt, I used a 1 inch white strip (1/2 inch finished) in the center of each of my blocks, but string quilts are equally pretty without a uniform center. 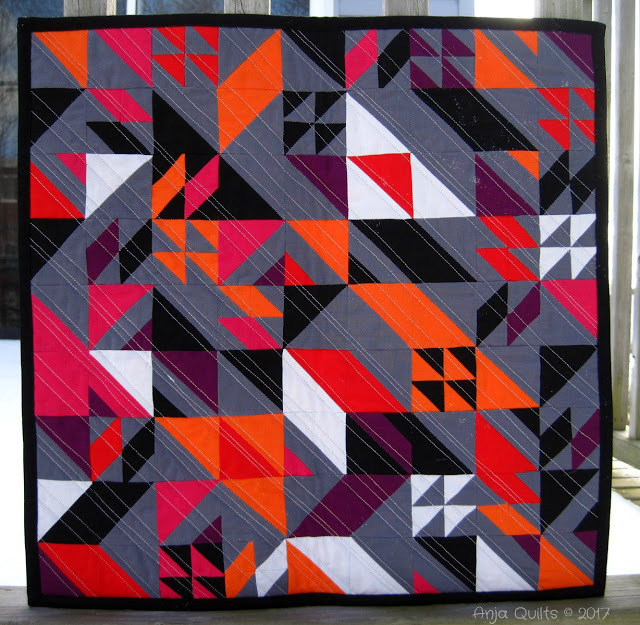 Check out my Vertigo quilt to see one that doesn't have uniform center strings. 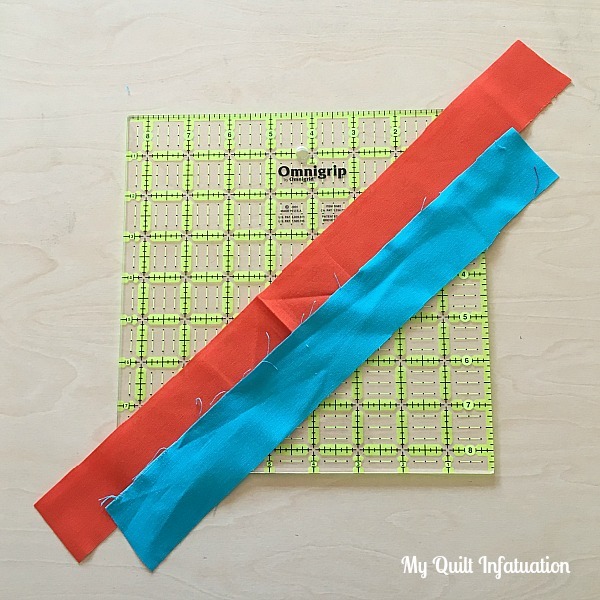 Once your strings are all sewn together (covering the entire ruler), press the seams either open, or in one direction, and use that same ruler to trim your block into a perfect square. If you're going for a wonky look, rotate your ruler a little while trimming, so that the center line isn't perfectly aligned. So simple, and the resulting quilts are always fun! Alrighty, friends! 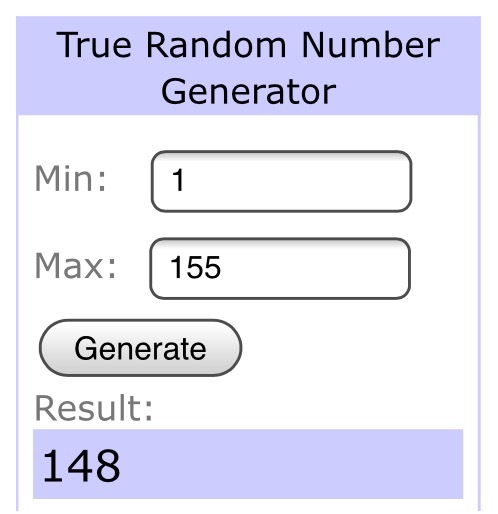 I owe you some winners from last weeks amazing sponsor giveaways. The winner of the spool of labels from Finer Ribbon is Melanie, comment number 42! 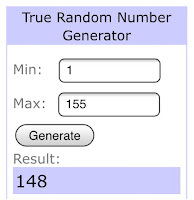 Lynne Tilley, comment number 148 is the winner of the $10 gift card to LouLou's Fabric Shop. 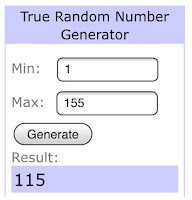 Comment number 115, Teagan, is the winner of the $25 gift certificate to Lady Belle Fabrics. Sonya, comment number 57 is the winner of the beautiful Bejeweled bundle from Fort Worth Fabric Studio. Congratulations to all of you ladies, and a huge thank you to all of my wonderful sponsoring shops that make it all possible! This scrappy star quilt is from Karen at Quilts, Etc. Okie dokie! It's time to party, friends! 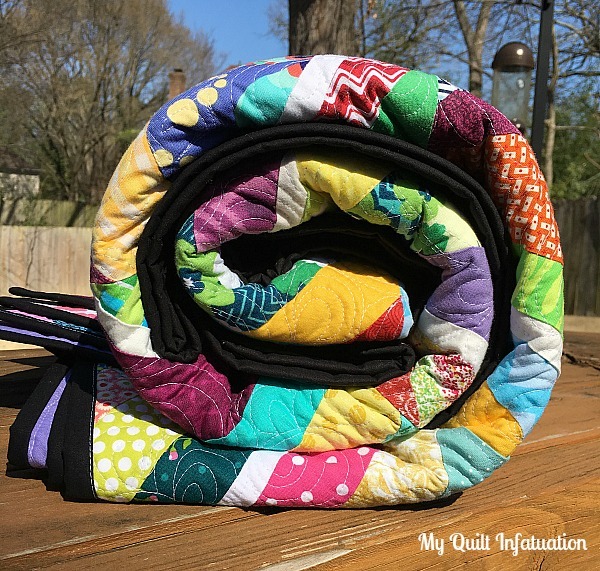 You can link finished projects or WIP's , but just keep it about quilting and sewing! Your Vortex is so beautiful and full of life. I love it! 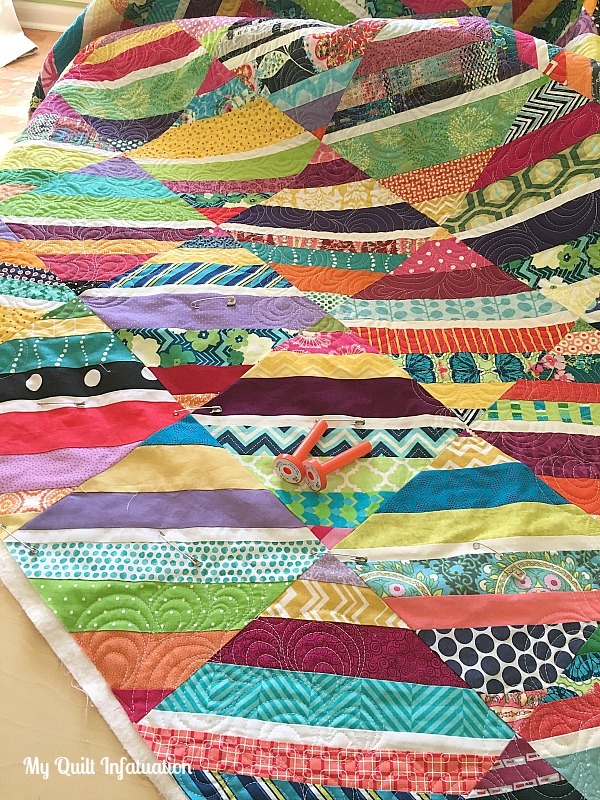 thanks for the feature - the scrappy star quilt is now basted and quilting has started. 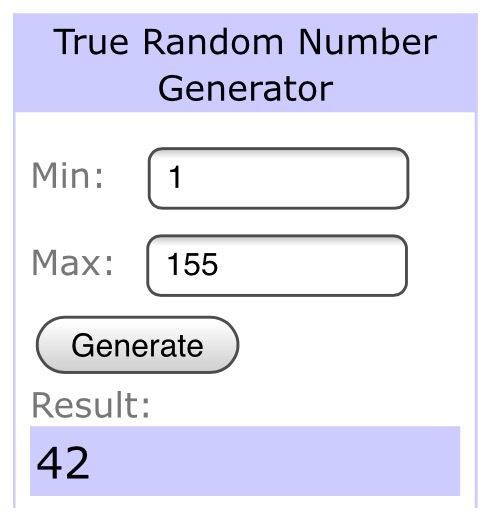 Congrats to your winners. I make my string quilts without a foundation also. What I did was used my 8.5" ruler to tape off a corner section on my cutting mat and measured my strips against this taped off section the same way you are using your ruler. It works wonders and avoids paper and foundations. I use the same ruler to square up. I love scrap quilts... I so do. Thank you so much for featuring my project and hosting the linky party ! 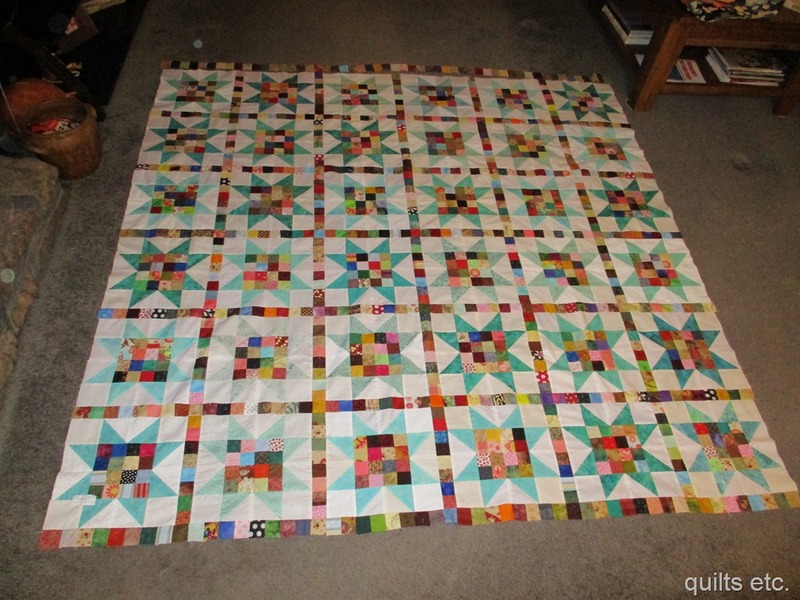 Great idea to not use paper when piecing a string quilt. How do the blocks hold up when you are piecing the blocks together and creating rows? Thanks! The blocks hold up just fine. I do starch them when I press, and that helps keep the bias edges in check. The way I see it though, even with paper piecing, once the paper is torn away, there are bias edges that way as well. I didn't have any trouble with them stretching out of shape at all though. I am still trying to make enough scraps to do a string quilt...I'll get there one day - yours is fantastic!! That's a lot of scraps. It looks great and I love getting something for nothing. I only once used a fabric background when in a class doing a crazy quilt mini, my issue was it was so thick and a lot more difficult to press when joining the blocks. I love string quilts and yet have only made one so far. Maybe it's time to start another. Thanks for the inspiration. The lines and shapes in the mini by Luna are just wonderful. 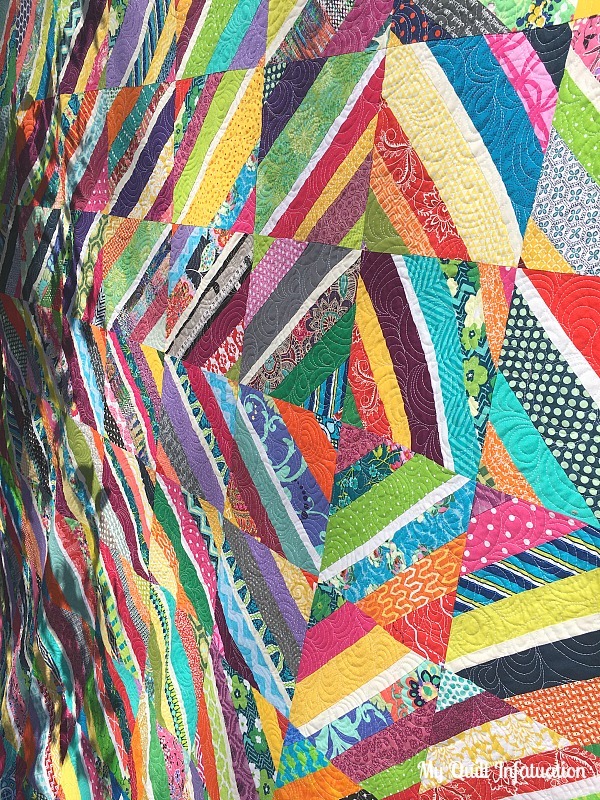 Such a gorgeous quilt and what wontful, if time consuming, quilting!! I love this paisley deesign but have never done it all over a big quilt. I would love to know what this feels like - is it still dray and snuggable?! 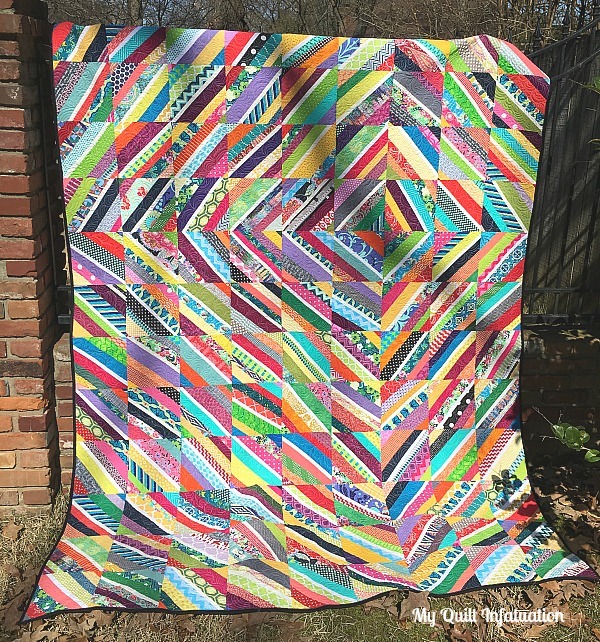 Beautiful string quilt, and your quilting is gorgeous! I love the quilt! Aurifil is my favorite thread, too. I think you choice of quilting motif is stunning. GREAT scrappy Vortex. Love it! 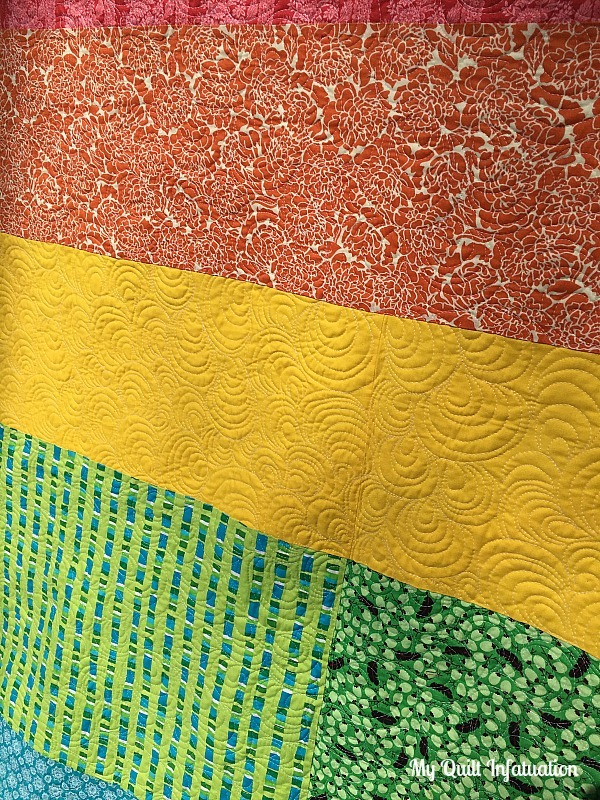 Love, love, love your paisley quilting! 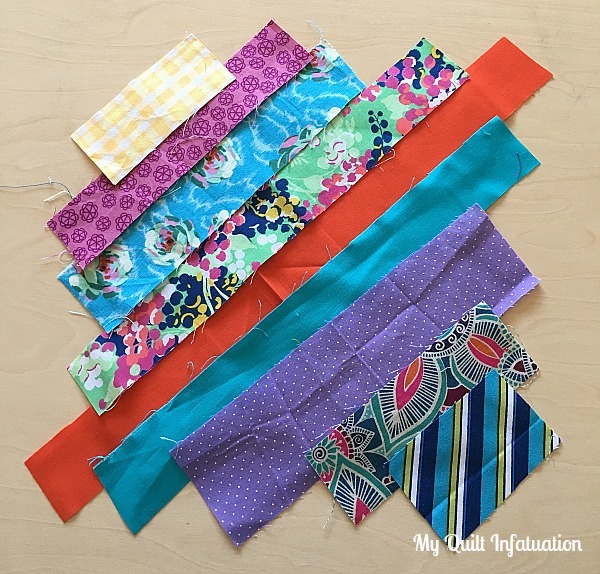 Thanks for sharing your tip for sewing string quilts. I'd like to make one but didn't want the extra bulk (and waste of fabric) with a foundation. 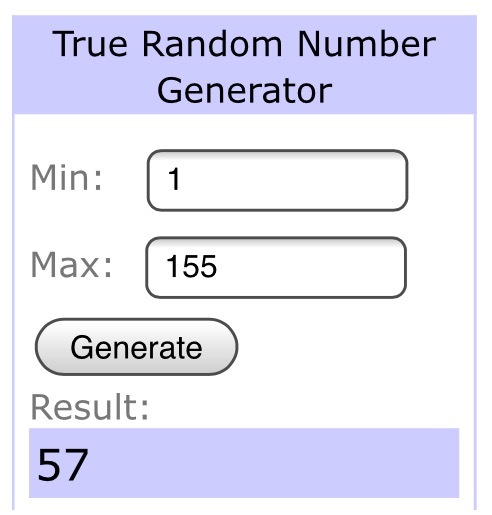 February Sponsor Post and Giveaways!